“I think we’ve had a good start as a line,” Aho said. And as a team, too. They helped the Eastern Conference-leading Hurricanes improve to 3-0-1 — their most productive start since the move from Hartford in 1997 — under new coach and former team captain Rod Brind’Amour. They earned points in their first four games for the first time since 1994-95, when they were still the Whalers and opened 4-0-1. 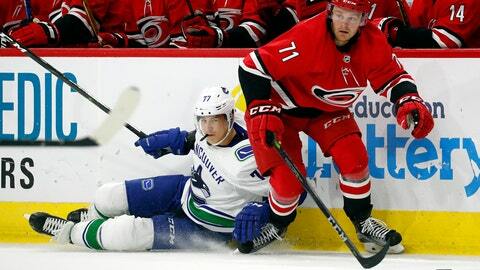 Curtis McElhinney made 22 saves for the Hurricanes while Jacob Markstrom stopped 28 shots for the Canucks in a game in which the first seven goals were scored in the opening 23 minutes, 24 seconds and the defenses tightened up before Foegele scored with 6:12 left to restore Carolina’s two-goal advantage.